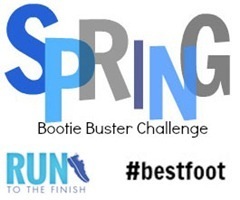 Shortly after the close of the Holiday Bootie Buster Challenge by Amanda at RunToTheFinish, I joined on for the Spring Bootie Buster Challenge. For fun. For accountability. The challenge started last Monday, March 4th. If you want in, I believe she is still accepting registrations HERE. The rules are simple. 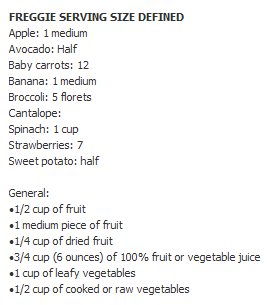 Eat your fruits & veggies (AKA – “freggies” – 7 to 9 servings per day), Drink your water (64 oz per day), and move your body in some way shape or form. We get one point for the freggies, one for the water and 1 point for every 10 minutes of exercise, which is why you have seen entries for stretching & pushups on DailyMile so that nobody can call me a cheater. So how did my week stack up? Even though it was a light run week because I was gone for the weekend thru Monday, I did okay. We’ll just start with Tuesday since I don’t think spiced jelly beans count as a “freggie” was traveling. SAT – Sick – 5 freggies (no points), 48 oz H2O (no points), no workouts (no points). This gives me a March 4th weekly total of 46 points. I certainly won’t win anything with this number but I like the idea of keeping on track, forcing down the freggies, and chugging the water. I’m not sure if I’ll recap every week but I wanted to give you an idea of what some of us are doing to “bust” our booties for spring. Feel free to register now, if you haven’t already, or play along on your own if you like! This entry was posted in Cross Training, Healthy Eating, Running and tagged BestFoot, Drink your water, Freggies, join a challenge, keep moving, Running, SBBC, Spring Bootie Buster Challenge by tootallfritz. Bookmark the permalink. Great start! I love how detailed your points list is! OK…no points for Freggies and Water for me….I just don’t get it! I will chalk it up to a “Ladies-thing” that you do to keep you “accountable”…..I just resort to my training schedule and other aspects of eating and recovery to keep me going as strong as I can. Why do you get points for water? Don’t you just take in water when you need it? OK…have fun with it and I acknowledge there are different ways to accomplish the same goal of being healthy and losing weight. Or is weight/fat loss one of the objectives? I am a quasi-expert in metabolizing fat (do a lot of research into it). So…I would think you want to focus reward points on not only diet…but doing the “aerobic” exercise that maximizes fat-metabolism. You know if you burn fat…one of the by-products is water…so the more fat you burn…there is some water returned that gets lost via sweat….meanwhile weight drops. I have one preferred source for burning fat…that is good read. Let me know if you want the citation(s). You would benefit by adding points for “duration” of low-aerobic exercise (doesn’t matter if running, cycling or other machines…just continuous duration). Give points for 20, 30, 45, 60 minute continuous low-aerobic intensity exercise. At 60-min…at low intensity effort…fat is high-proportion in fueling body’s metabolism. Take in Gatorade during….then you compromise the fat-burn cause you putting in free-carb circulating in the bloodstream. Maybe I don’t recognize exactly what the program is all about….and maybe not about weight loss….but if it has that as part of its ultimate goal…then I have some points that are being neglected. What you eat and drink is one thing….and what and how you do the training another. Sorry…just the way I be! I think you had a great week! I started slow and hope to keep on improving as the weeks go by!